So I have my own set of runestones. The problem is I have no idea how to use them or read them. Any pointers? One of my favorite, even though completely monkeyproof and oversimplified, books on the matter is "Runes" by Andy Baggott. It's a nice startingpoint imho. I was fortunate enough to first learn the runes with a local teacher, in a class that met once a week for 13 weeks. If you can find such a person where you live, that could be a helpful option. The really helpful part of the class is that we only introduced two new runes each week (leaving week 13 for review). Even if you're learning from books, I'd highly recommend that strategy: focus on a pair of Runes, and meditate on them, journal about them, call on their energies in magical work, or work with them in whatever ways are meaningful to you for a whole week or more, before moving on to the next. This keeps things from getting too overwhelming, and it helped me to get start to "get" the Runes, by relating to them one or two at a time, rather than trying to take on too much at once. 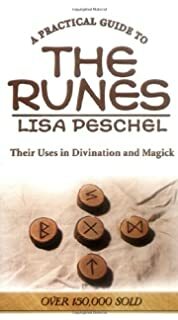 The book The Runes by Lisa Peschel is also a great one. Simple, easy to follow. A great place to start.